Lean beef loin is fit for making steak and roast beef in addition to Japanese-style dishes such as sukiyaki and shabu-shabu (beef thinly sliced before boiling in water). On top of being an excellent source of amino acid score complete protein, it serves as a good source for B vitamins and zinc. The calories in Beef Rib Loin Lean per 100g(1cut ) is 174 calories. 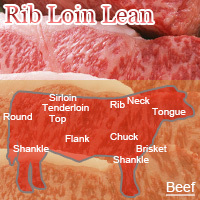 Beef Rib Loin Lean is calculated to be 174Cal per 100 grams making 80Cal equivalent to 45.98g with 21.1g of mostly protein、8.9g of fat、0.4g of carbohydrates in 100g while being rich in vitamins and minerals such as Selenium and Vitamin B12.